Salt Domes of Iran is part of the Tentative list of Iran in order to qualify for inclusion in the World Heritage List. Salt domes can be found in many places around the world and by itself isn't anything so special, but the amount of concentrated salt domes in Iran is surely something spectacular. I visited the longest cave system on Qeshm (referred to as Ghesm in documentation) Island. Because Qeshm is another tentative site at the moment I will not go into much “how to get here” but instead just say it takes about an hour from the car ferry port Laft and the last 20km is a dirt/sand road that is fine for 2WD. The village before this diet road starts also has some of the nastiest speed bumps I've had to endure and camels may graze near the road so be careful. The salt cave is smack in the middle, okay south, of the Qeshm Geopark. The entrance is free but if you don't have a torch you can rent it for cheap. The phone torch apps will not be good enough but I used it to see where I'm walking while the headlight shines forward. The parking lot is just 200m away from the caves. It has one sign but I wish it had a few more to start digging into salt some science. So I said I visited the longest cave system but unfortunately only 1 of the caves is open. Another one is open for pre-appointments and I suppose that means a guide too, the 3rd is only open for geologists. I was happy with the first one. I have never been allowed to spelunk in a cave by myself, although it's not too long maybe 400-500 meters and nothing dangerous could hurt you but the low ceiling. 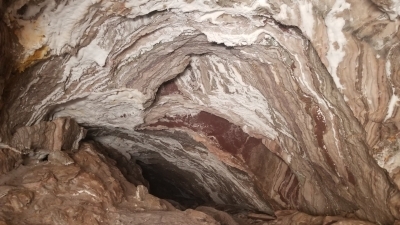 The entire cave is plastered with different colors of salt. The fine white snow-like style is the most striking, but the grey cubes are pretty cool too. Another small mini cave nearby has more of the same. The entrance is probably most impressive with the daylight shining on it. The entire mountain range is covered by snow oops I mean salt. It's truly something to look at. I wish I could seek out more caves but the southern area isn't on my itinerary and I don't know if they are as accessible as Qeshm, and especially the combination with the rest of the Geopark makes this an easy “must go” place. I feel totally detoxified.